There’s something quite magical that happens when you find your true passion. Your profession doesn’t feel like a job, nor does work actually feel like working—it’s your purpose. 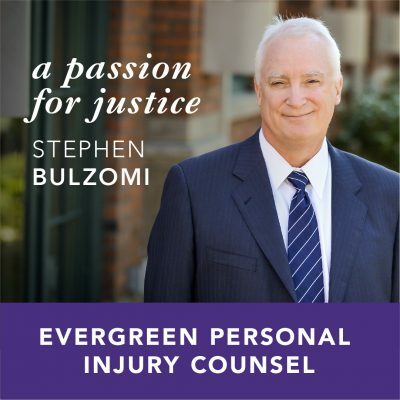 Evergreen Personal Injury Counsel attorney Stephen Bulzomi has built his career on fighting for his clients in personal injury cases for more than three decades. From alcohol liability, to negligent hiring and retention, to holding corporations responsible for the damaging actions of their employees—Steve is not only well-versed in injury law, he has an unrivaled passion. Recognized as one of the best trial lawyers in Washington State, Steve has been listed as a “Super Lawyer” by Washington Law & Politics since 2000. He has been given the highest rating of “A/V” by the peer rating organization Martindale Hubbell for performance and ethics. Steve has also been selected by practicing colleagues for inclusion in peer-reviewed The Best Lawyers of America for personal injury litigation. Despite his lengthy list of accomplishments, the best reward for Steve is finding justice for his clients. Steve finds the challenges of his work highly rewarding. “I enjoy being a force for change and applying the law for my clients—and I enjoy changing the law for the better when I have a chance to do that,” he says. Steve knows that he owes a big part of his own professional development to working with more experienced colleagues. He passes on his own experience by mentoring new lawyers with the Washington State Association for Justice. He appreciates the goodwill that comes from being an active part of the legal community. Once the door closes behind him at the end of the work day, Steve does his best to leave his work at the office. He’s happy to spend the rest of his time being a husband and father. He does find that his legal training helps with family problem-solving and keeping things fair! When he’s not at work or preparing for trial, you can find Steve relaxing with his family, cheering on the Huskies, bicycling, or golfing. Steve regularly shares blog posts to his website on legal topics, such as medical negligence and alcohol liability. To read more from Steve, click here.